Opposition Leader in National Assembly, Chaudhry Nisar Ali Khan Wednesday said that Muttahida Qaumi Movement (MQM) Chief Altaf Hussain should seek apology from the nation. Talking to media men outside the Parliament House, Chaudhry Nisar said: “Altaf Hussain should do public politics after coming back to Pakistan.” adding ‘it seems Altaf Hussain is not in senses when he speaks’. “We will have to bring to light documents obtained from a rehabilitation centre in London where one had to go for treatment of a disease,” Chaudhry Nisar said, adding, the disease still remains uncured. Muttahida Qaumi Movement‘s Deputy Parliamentary Leader in the National Assembly Haider Abbas Rizvi in a fiery tone outside the assembly building said all the lions of Pakistan Muslim League-Nawaz (PML-N) became jackal and scared away, News reported Wednesday. MQM Leader Hyder Abbas Rizvi while commenting on Ch Nisar Ali Khan’s comments said that personal attacks were made by PML-N leadership at that time when political setup was working smoothly. 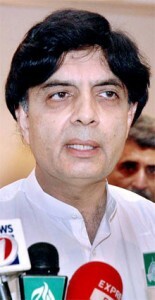 He also called Ch Nisar as Mr. Bean. MQM leader Wasih Jaleel said that his party had reservations with PPP but PML started war of words. He said that PML-N issued baseless statements about their leader Altaf Hussain. He said that he knew what was happening in Raiwind. He said that PML-N wanted to open Pindora’s Box. MQM uses third class language: Abid Shair Ali PML-N leader Abid Shair Dil said that MQM used a third class language about his party and leadership. He said that Altaf Hussain should return to Pakistan to take active part in the politics and should avoid issuing such statements while sitting in London.